I have been learning a lot of wonderful things from joining HelloMornings challenge in the last 2 year. I don’t know how many times I almost gave up. But by God’s grace and encouragements I got from my friends and sisters in HelloMornings group on Twitter and Facebook, I am moving forward, I take tha challenge. I wanna be changed by God to be a productive person, be the wife God wants me to be for my husband and be the mom He calls me to be for our daughters. Now, I mostly go to bed by 10 pm and wake up between 5:30 – 6 am, sometimes even 4:30 am! I have the most wonderful intimate time with my God, time to pray and extra time to get myself ready for my husband and daughters. On Saturdays, mostly my hubby will let me sleep in and he keeps the door close and keeps the girls out of our bedroom so I can sleep or just lay down resting. I love my husband, how he support me and encourage me all the time! Here’s a glimpse of my every day morning. Adjustment happens all the time. 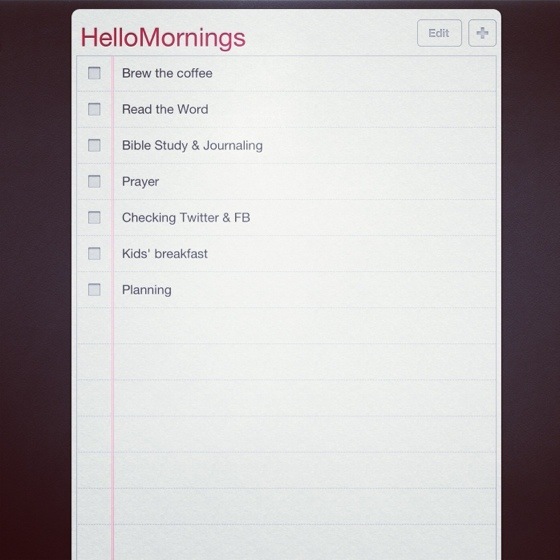 But by making this plan, I have a guide line of what to do every morning that helps me. One more thing I would love to accomplish in this season is do more exercises. I have a sciatic nerve problem with my 2 pregnancy and it bothers me until now, especially when I pick up something heavy or do more movements. I am still looking for the best exercise that will help me with healing the sciatic nerve pain and get me healthy. I hope that this season, God’s glorious grace will enough for all of us to reach our goals according to His own will. Thank You for supporting me and my family in prayer! I rewrite my older post into this post after thinking through what God has been teaching me through HelloMornigns. This post I link this post at HelloMornings blog.